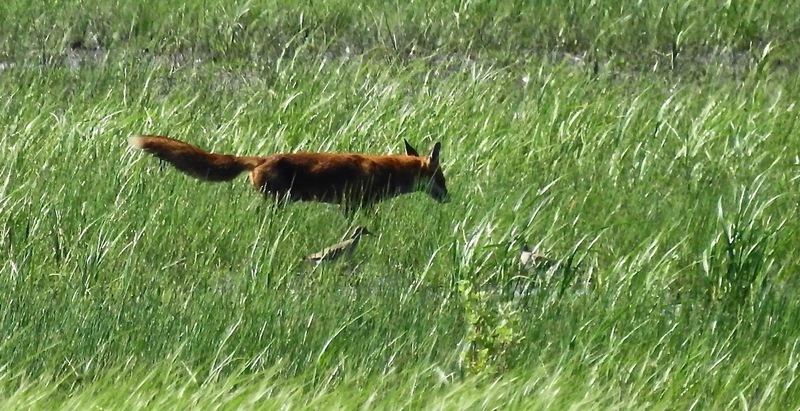 It was all going so well at Marshside this morning, despite the hot conditions – two Curlew Sands and two Little Stints were feeding amongst the Dunlin and Ringed Plover behind the Junction Pool and Great White Egret and a Peregrine went over, heading north. The heat lured Tropical Thomason out, and he joined me checking through the waders (once he’d gone back to get his bins). 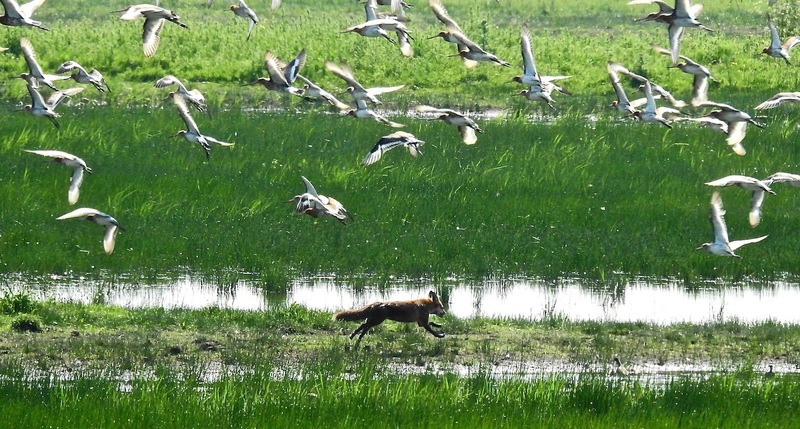 Then things got all foxed up. Everything was a bit jittery after that, so I wandered down to Nels as the temperatures started to rise. A male and female Garganey were dozing quite close to the hide, but with the late morning sun behind them, they were never going to perform too well. The wibbly wobbly heat made watching a Spot Fly just south of the Junction Pool tricky too, but occasionally it perched up in the willows. 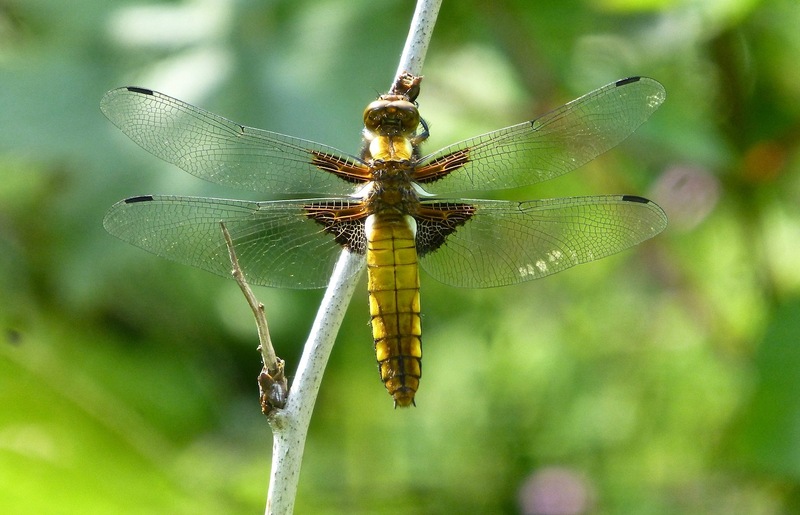 Back at Dempsey Towers the sultry south easterly yesterday brought two Broad Bodied Chasers into the garden (only the second time they’ve visited in twenty years), and Swifts and House Martins whizzed through ahead of the rain with two calling Med Gulls to boot. 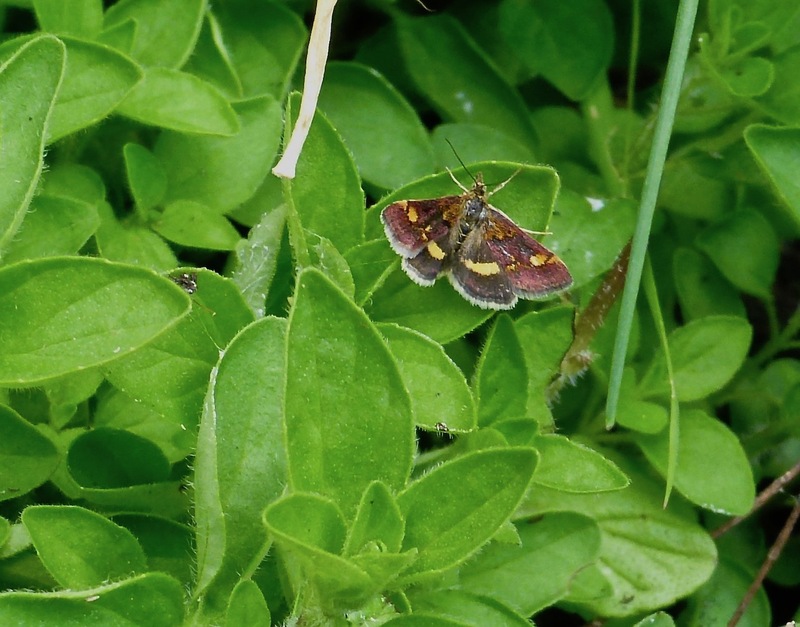 Beer and chasers – mmmmm…..
As the year heads bugwards a tiny Pyrausta aurata was zipping about when I got home today, an exquisite midget gem, but I hope I can see a few birds more before it all goes micro moth. A good day to walk the dog out on Plex today (I know I don’t have a dog – not that kinda dog). With everything a bit late this year, and birds still popping up on Lundy, there is still an outside chance of Dotterel just (I’ve found ’em on the Withins in June before today). But today wasn’t that day. 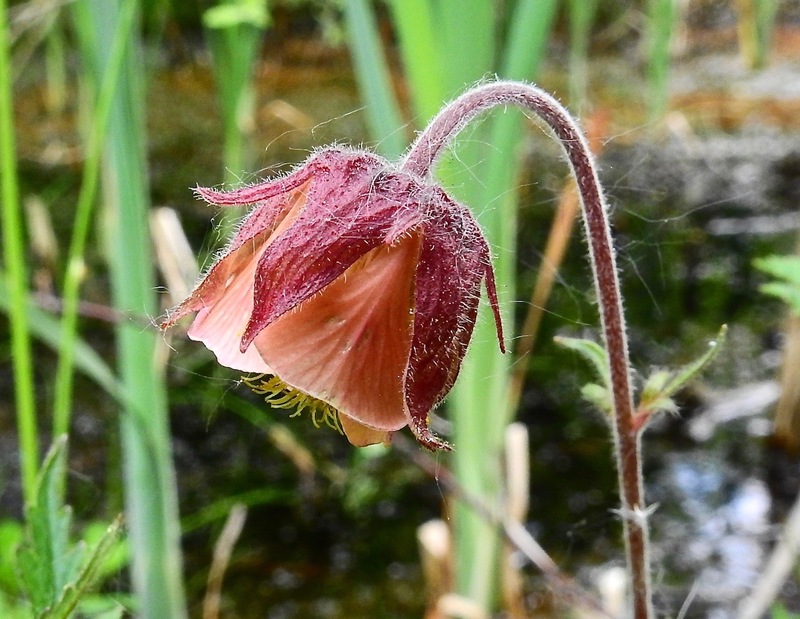 Water Avens looking wispily weird and wonderful, plus Northern Marsh Orchids pushing up in select colonies. 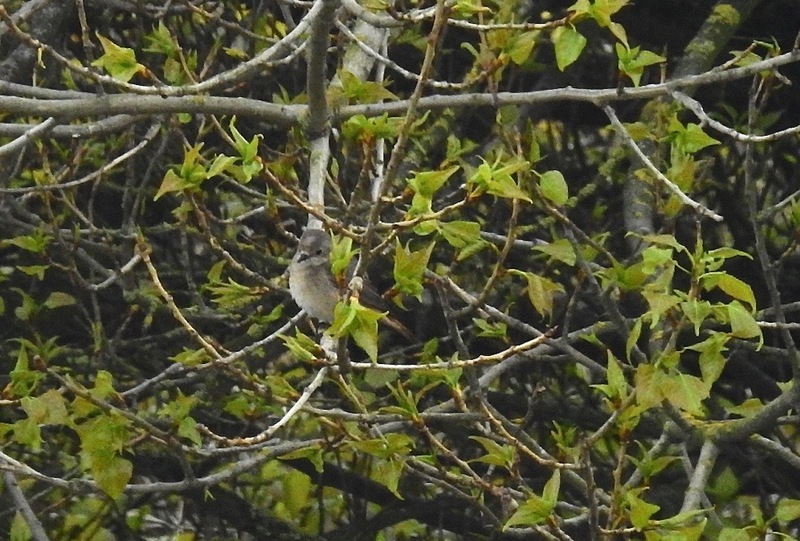 At Haskayne Cutting a Garden Warbler showed briefly then was chased off by the overly aggressive male Blackcap, (it was even hassling Whitethroats, do behave). That’s what being territorial means I guess. Too early to be getting botanical yet though, so I headed back out onto the open fields. 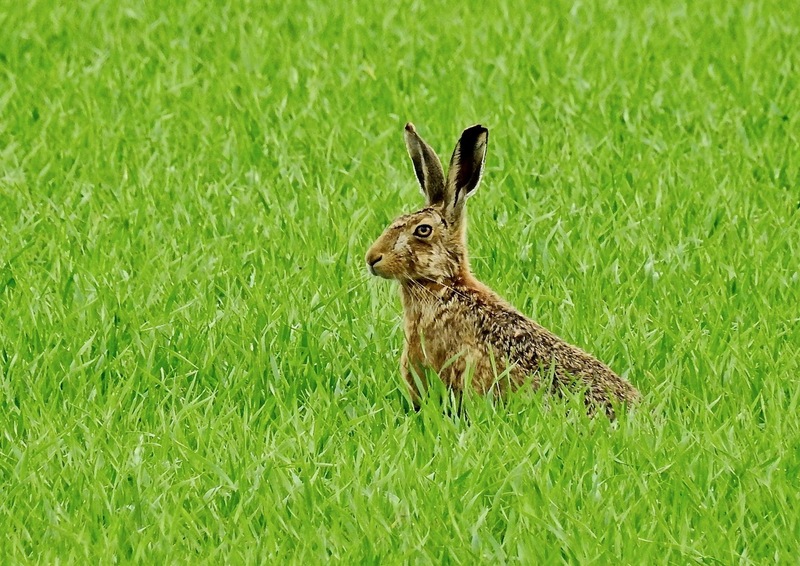 I’m currently reading Ian Newton’s excellent, but sobering, New Nat “Farming and Birds”. I just hope they’re not reading it too. 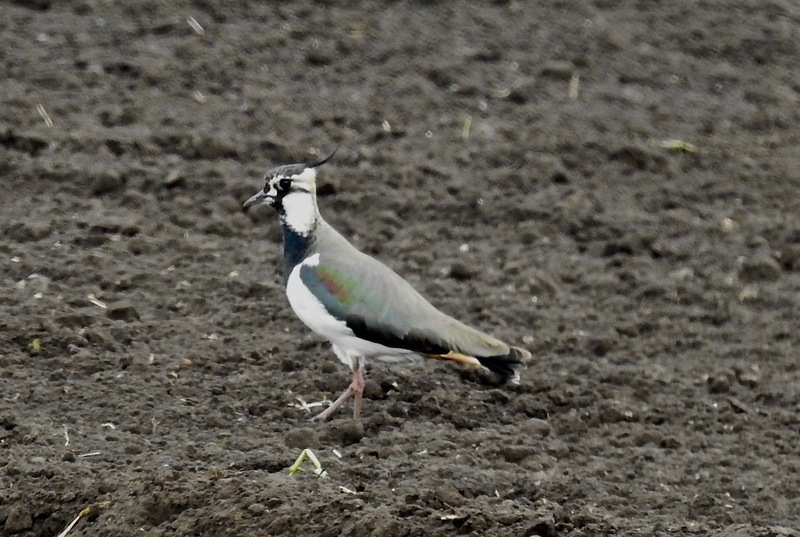 A few Yellowhammers about, and Whitethroats conspicuous, while the usual early summer flocks of Herring Gulls and LBBs were foraging on the freshly tilled soils with Stock Doves, Woodpigeon and a few Mistle Thrush. I’m very much in the Mark Twain school when it comes to golf, but even I was surprised to discover that the prime objective is actually to get the little white ball into the SSSI ditch lagoon, not in the wee hole by the flag. The air was blue enough to make the Greater ‘Pecker above the public footpath through Hesketh Golf Course blush as I walked on this morning. Sweary golfers notwithstanding I thought I’d get out early to enjoy the day before it got too hot. 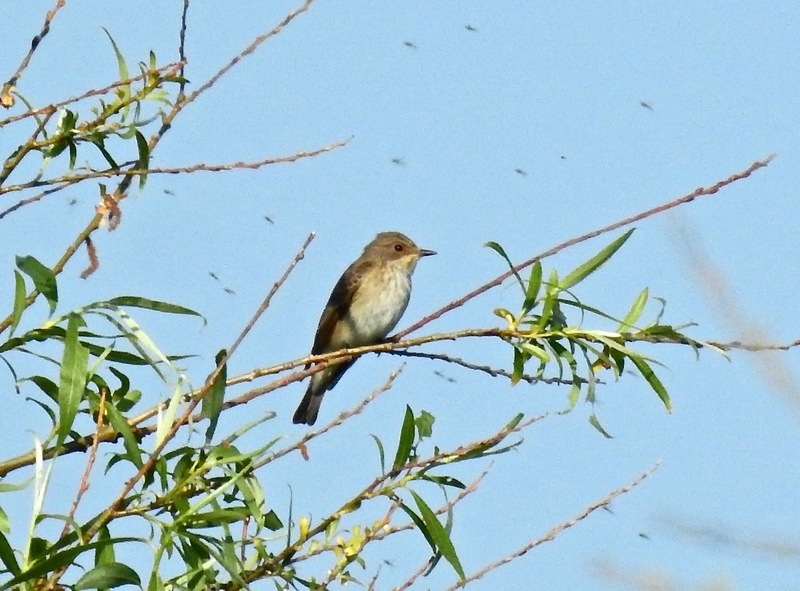 But I wasn’t so early that Stuart Darbyshire and Pete Allen weren’t there before me, watching two Spotted Flycatchers as they zipped about gorging on the large amounts of midges swarming around the willows. 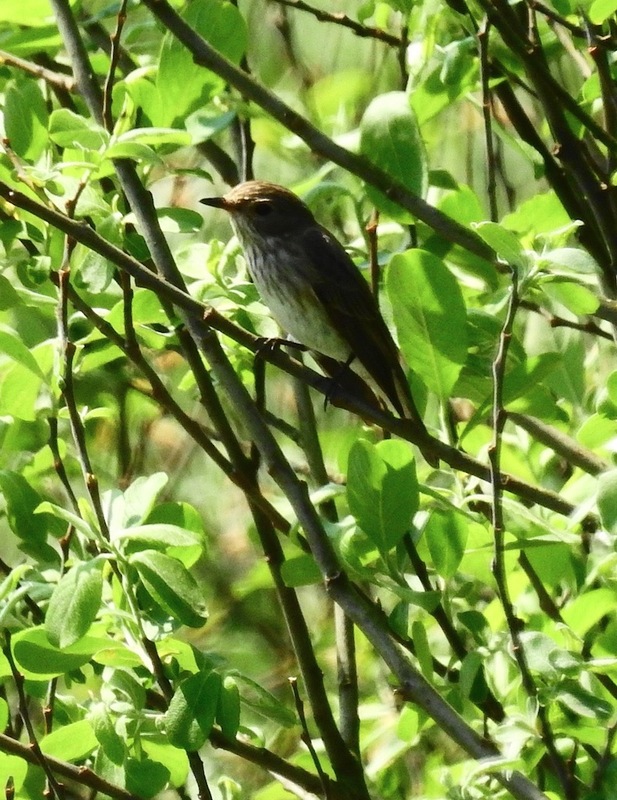 We enjoyed the flycatchers for twenty minutes or so as they darted about, inevitably reflecting on their crash as breeding birds, along with so many others. Percy Sledge numbers still way down on previous years, but as I have a medically recognised allergic condition when it comes to bunting and confetti, I decided to stay out at Marshside for a bit longer, even when the day started to heat up and the aroma of “Gawd bless you ma’am” lay heavy in the air. 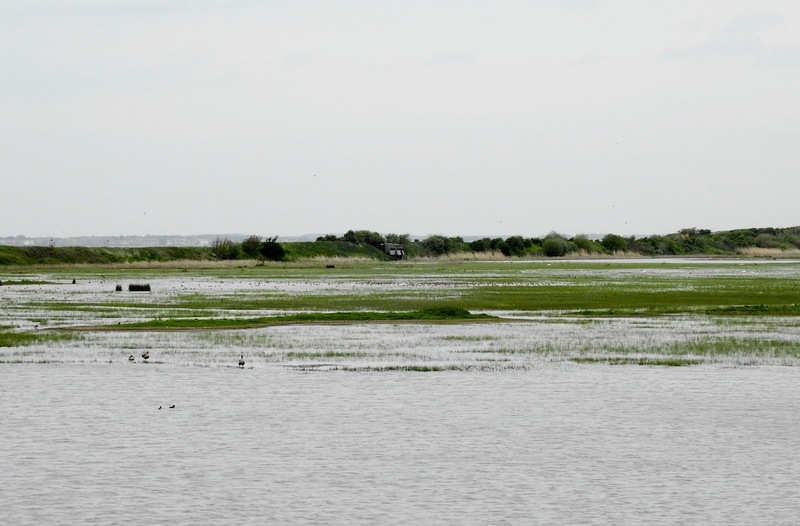 Just one or two Dunlins (including a small, small-billed bird) with the dozing Blackwits from Nels and the halfway screen, a new Chiffchaff singing by the Sandplant and egrets everywhere. Flocks of birders out this morning, crowding onto the platform at Hesketh Road to ‘scope the large numbers of Dunlin at the southern end of the marsh. All a bit distant still (the birds, not the people), but at least one Curlew Sandpiper threaded its way through dozing Blackwits, when a circling Peregrine wasn’t terrifying the massed Dunlin, godwits and smaller numbers of Ringed Plover. The Glossy Ibis were still keeping a low profile (distantly) over by the fenceline, and a male Whinchat and at least two Wheatears were in Wheatear Corner. 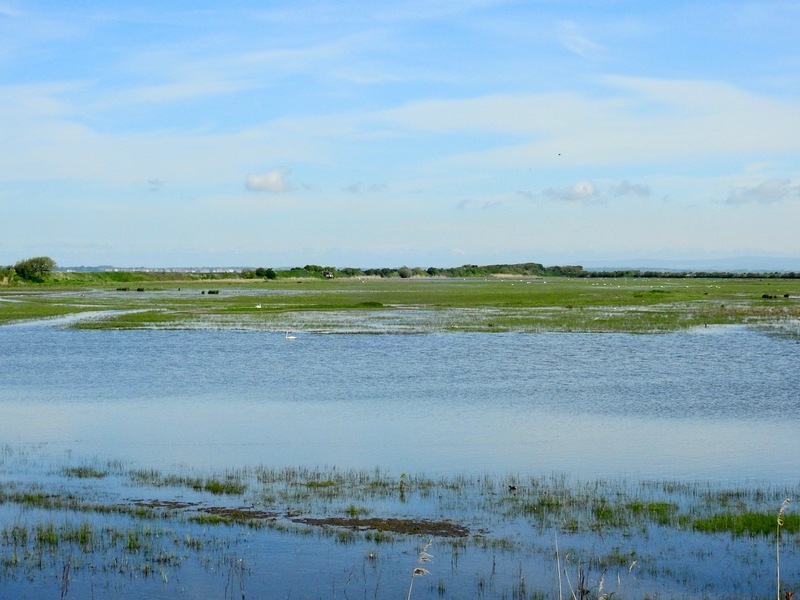 Everyone agreed Marshside was looking spot on this spring for a mega-wader – but we say that at this time every year. 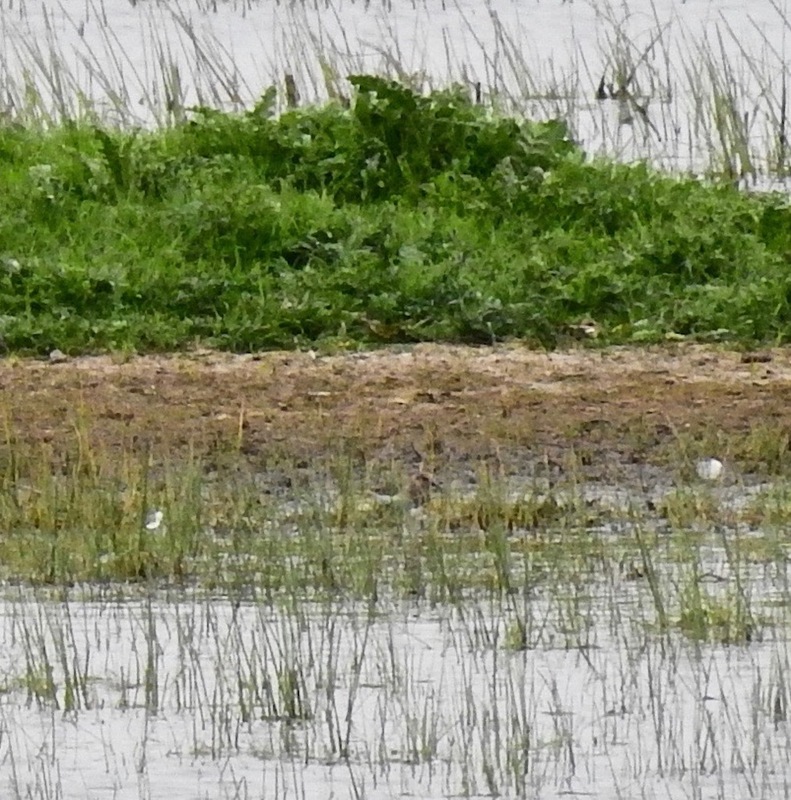 The Temminck’s Stint had cleared out, but it was still there and distant yesterday, having first rocked up on Thursday. After a good chinwag I headed south to Cabin Hill, where a Gropper was reeling away, alongside singing Willow Warblers, Chiffies and Whitethroats. 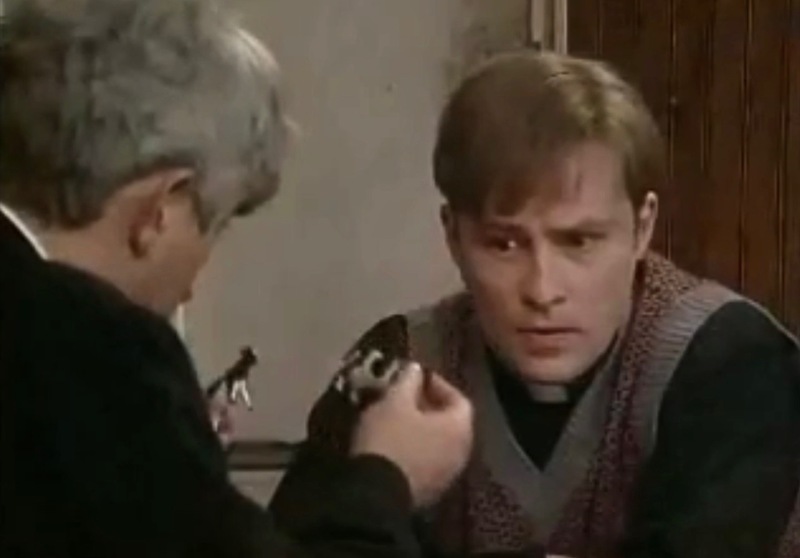 The difference is not always as obvious as Father Ted led Dougal to believe. The splendid Temminck’s Stint found by Stuart Darbyshire at Marshside this morning was small. But by the time I got to grips with it, the bird was also far away. Even with the benefit of a kindly lent ‘scope view from a twitch member at lunchtime (I didn’t get your name, but many thanks) I was hard pressed to tell the difference. 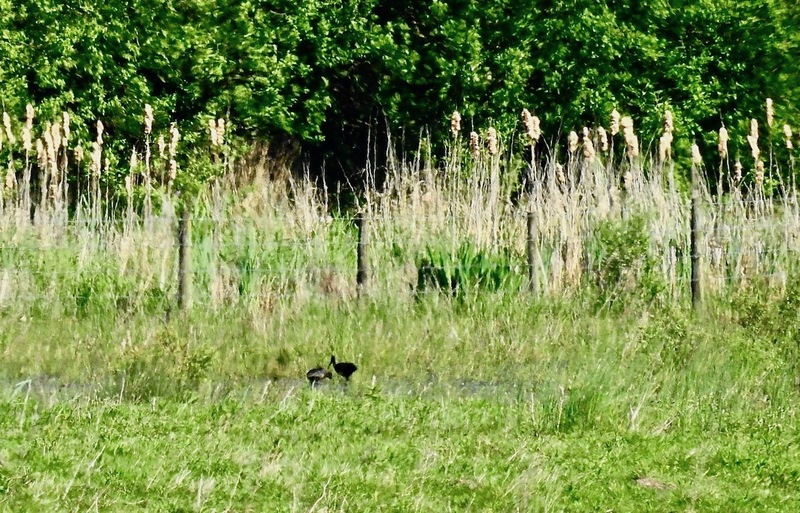 You can just make it out on this long range zoom pic, halfway between the two white feathers on the muddy edge of the back ridge to Fairclough’s Pool. If you look really hard that is. Just. Through the ‘scope my squint at the stint revealed the usual Temminck’s creeping posture and pale legs. 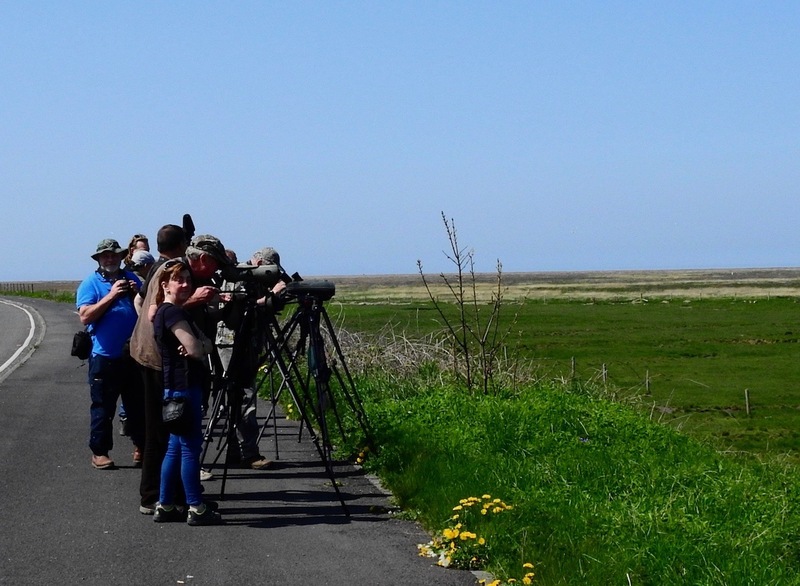 The bird drew a fair crowd who watched from the platform on Hesketh Road, while large numbers of Swifts fed in the cold easterly air over the Marine Lake to the south of us. 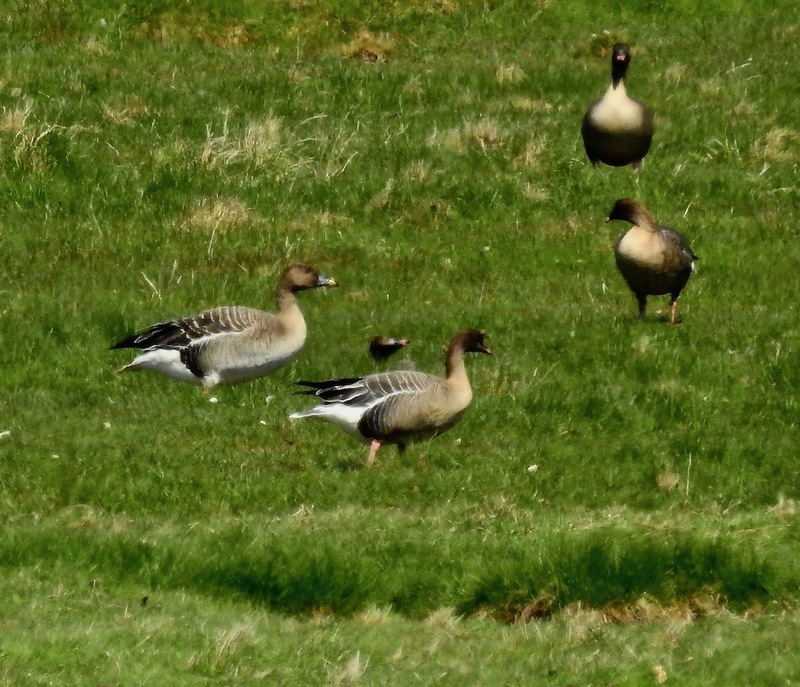 Two Great Whites about earlier too, and rather oddly, a Willow Warbler feeding on the lawn at Dempsey Towers first thing…. The type of weather that makes an ice-cream van driver beam today – and it lured just about everyone out onto Marshside too, so it was fun socialising inbetween dodging melanomas and cyclists. 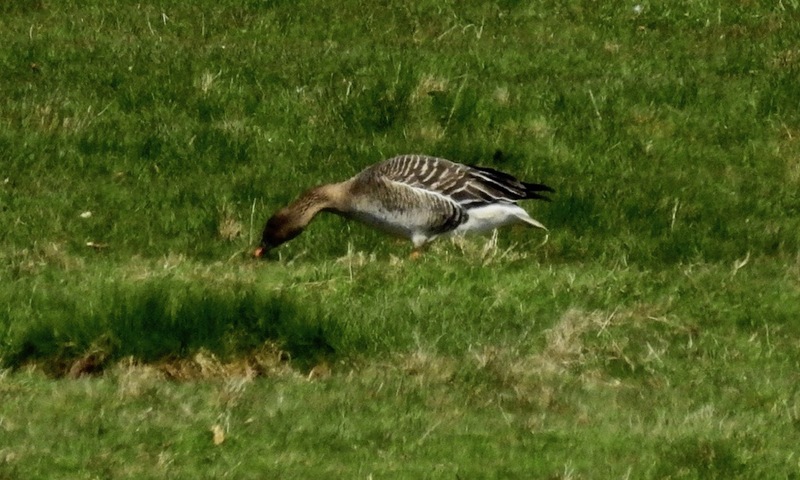 One of the Tundra Bean Geese (left hand bird in the pic above) was still with about 250 Pink Feet, which were slowly melting in the heat on Crossens Outer, so with Trops and Bazzo I hooked up with the hottest goose twitch on the planet. 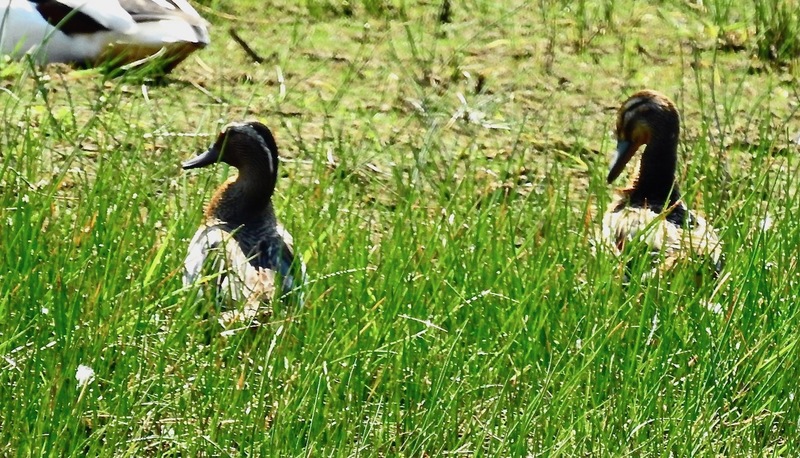 Hard to get a picture in the shimmery heat, and not much easier to get to grips with the drake Garganey on Marshside One either, as it dozed in a clump of vegetation as the mercury climbed. Looking into the sun from Nels it was difficult to see it, but its lightning strike eyestripe gave it away even in these white light conditions. From the inland side of M1, four Curlew Sands were feeding with the sparring Ruff and Dunlin flock with a few Ringed Plovers, but at range. Perhaps most interesting this morning was the Great White Egret I picked up that flew south high over Marshside One at about 1030, followed by another 30 seconds later…then another…then another…. The four birds were all following the same flight line, and presumably in sight of each other – has anyone had a group drop in south of us today I wonder? Go on, break the habit of a lifetime and communicate. 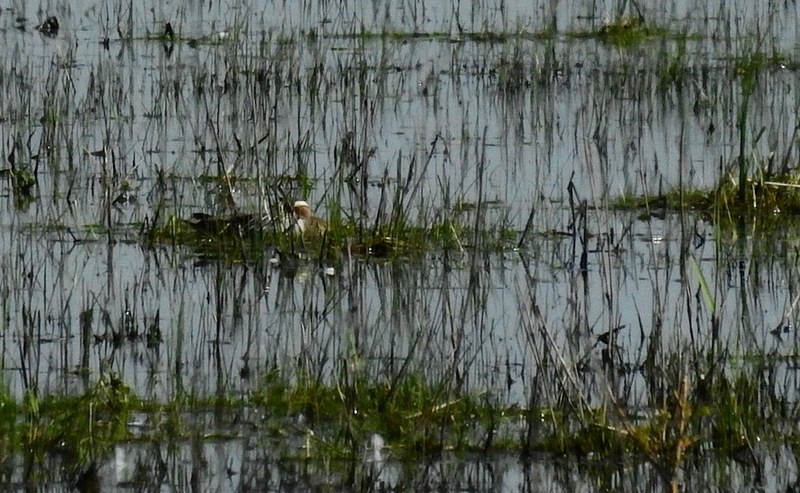 At least three of the birds had strong yellow bills. Lovely to see everyone this morning…99s with raspberry sauce all round!!! It was grey and still so I took a quick look around the dunes south of Shore Road at Ainsdale before work this morning. 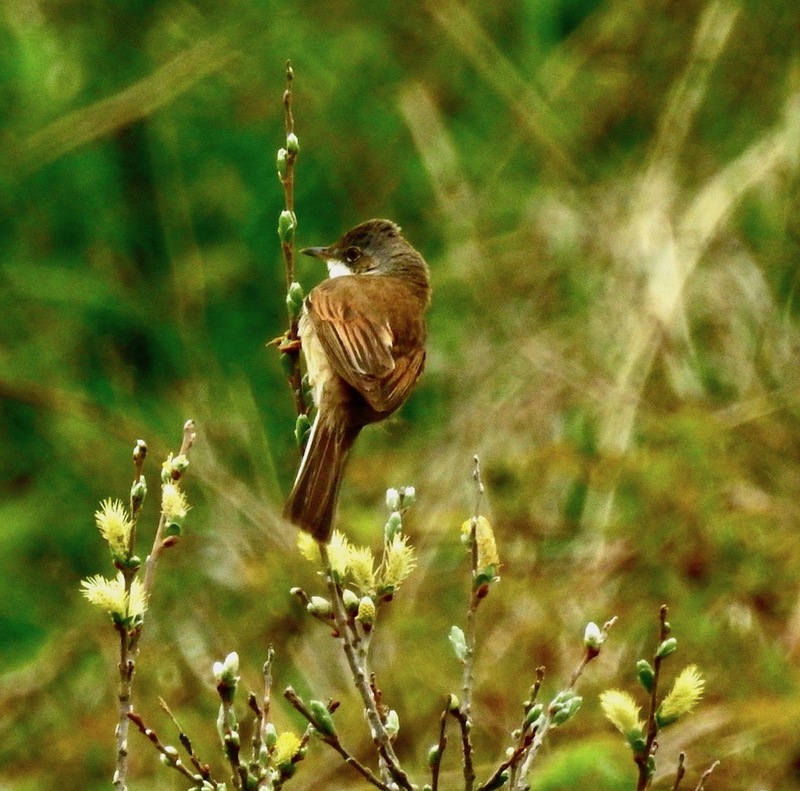 Whitethroats were displaying in the gloom and two Groppers were reeling while three Greenland Wheatears put a zing into the day, with a light but steady movement of Swallows and Sand Martins through. 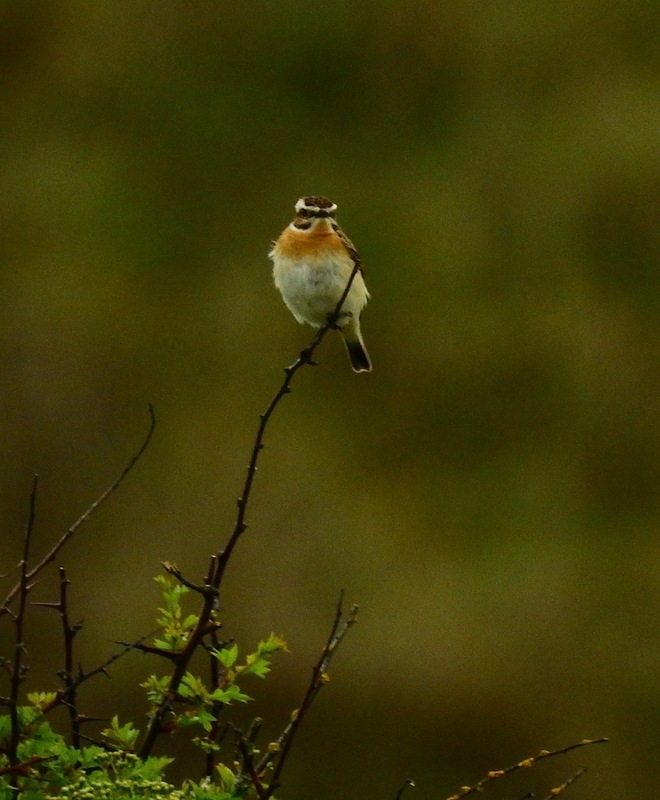 A gorgeous Whinchat watched me from the top of a hawthorn. 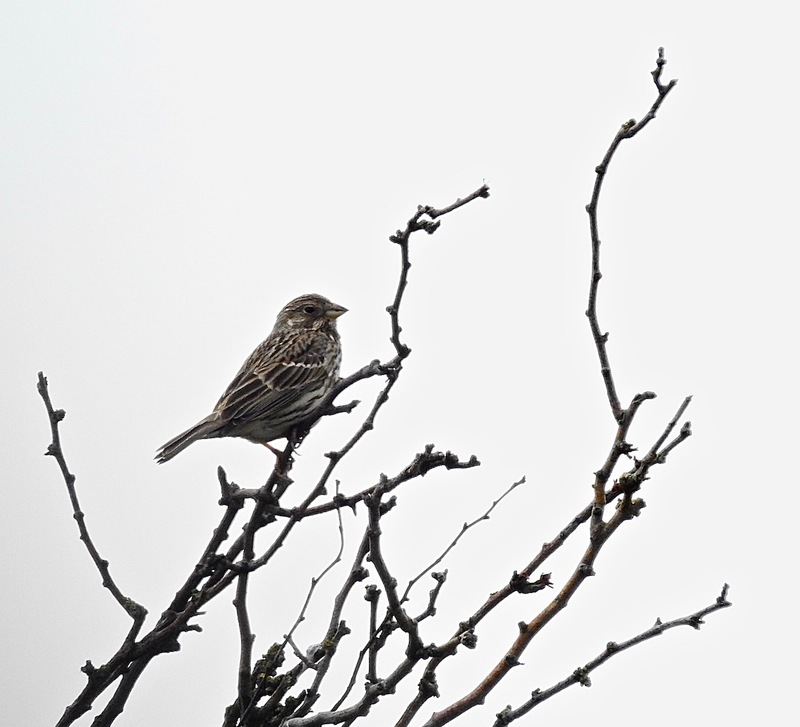 Territorial Stonechat and Mipits jostled for perches with the inordinately large number of Linnets that are on site this spring. 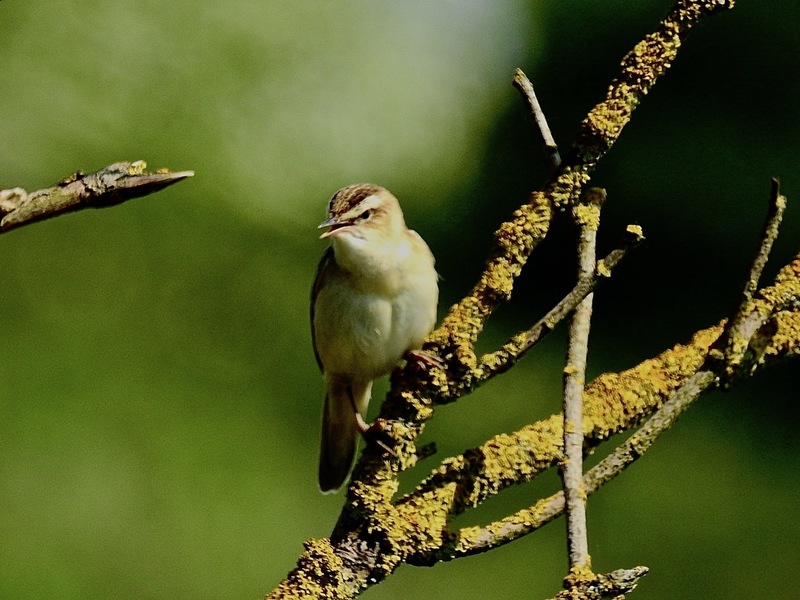 I knew I had an email in-box full of fun waiting for me back in the tower so I retraced my steps and logged in at about 0845 when a movement caught my eye below the window – a female Redstart was flycatching from the nearby stunted poplar. 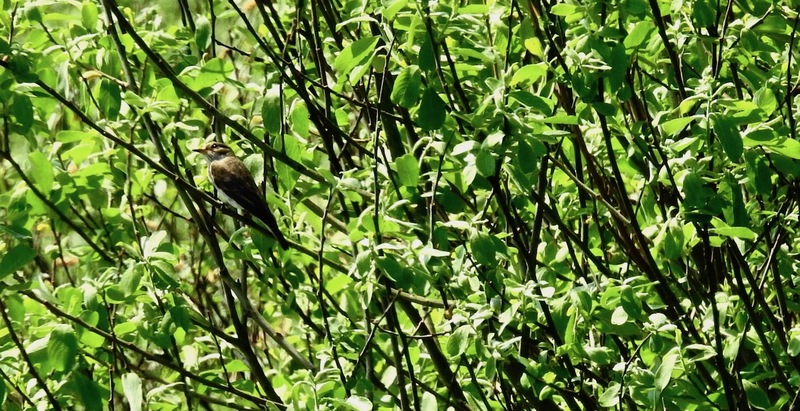 Great stuff – I’ve always hoped of finding one in this bush, which over the years has yielded Cuckoo, Whinchat and Hobby for me. Sadly the Redstart didn’t hang around for long, but I managed a poor “through the window” picture showing an odd pale patch on her crown before she zipped away. Not bad for twenty minutes or so, so I took another stroll at lunchtime, from 1245 to 1345 by which time the day was heating up and the clouds melted away. It was quieter, but Tree Pipit headed north over the sheep enclosure, and Gropper, Whitethroat, Willow and Sedge Warbler were still singing. A Yellow Wagtail “sweeted” south west and the hirundines kept on coming – I even managed my first House Martin of the year, embarrassingly late. 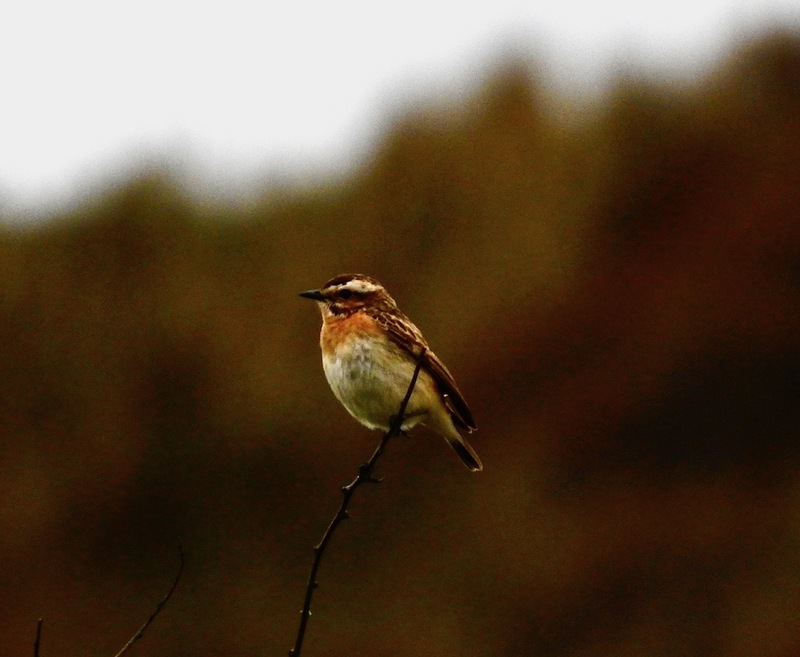 A flurry of eight Greenland Wheatears appeared around the office and a male Whinchat popped up – I guess it could have been the same bird from earlier on. 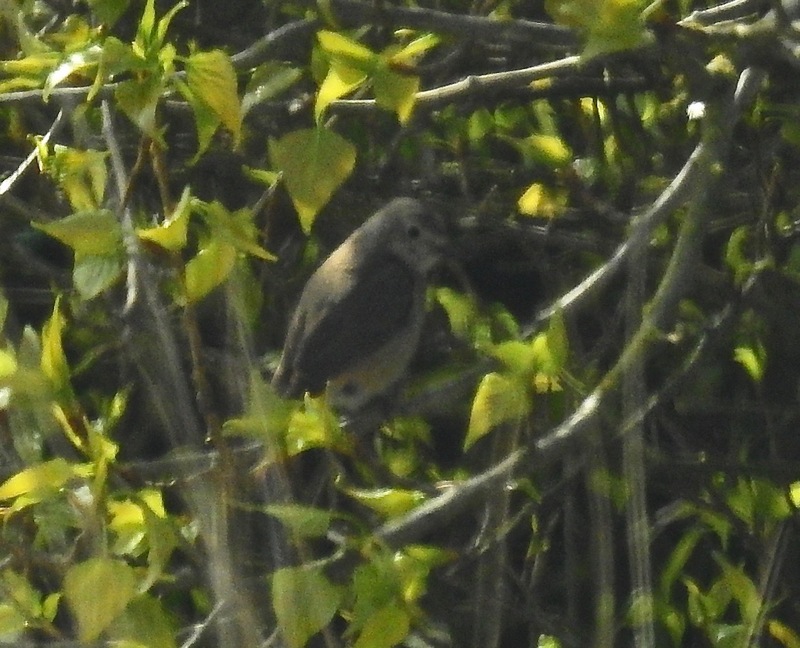 Even better a female Redstart put in a fleeting appearance, beady eyeing me up from the deep shade of the poplar bush again. A pale spot on the crown again was just visible – so she had hung around since the grey of the morning after all. 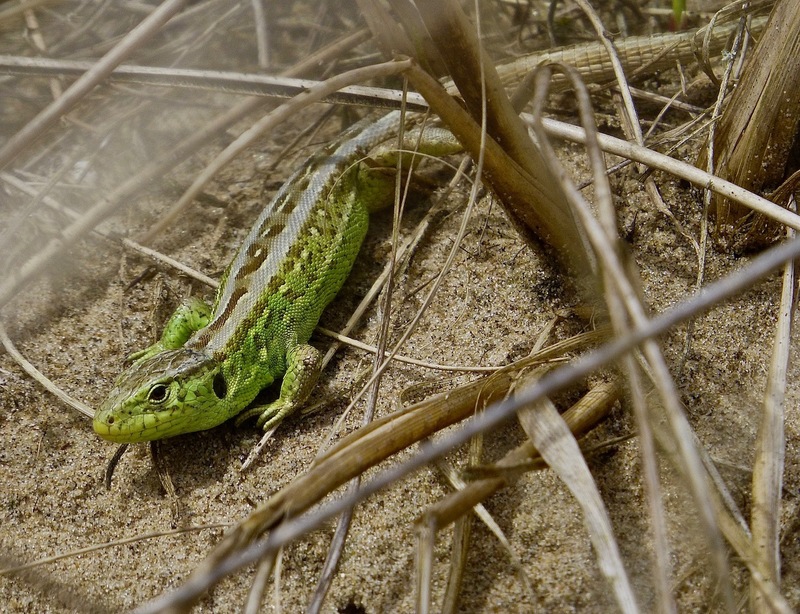 A fine end to a week which has been good for Sand Lizards thanks to the unseasonal combination of sun and cold cold air until today. Warm enough for them to bask, but too cool for them to get overly active till later in the day. I blagged this beast of a male a few days ago on the coast – a real treat.